Though I wasn't making the social rounds in the 17th century, it seems appropriate to refer to the Upper East Side's Fair Folks & A Goat as a modern day "salon." A former ballroom in a classic Carnegie Hill prewar, this space is open to the public through appointment. 29-year-old Florida native Anthony Mazzei and his 27-year-old co-partner Aurora Stokowski, who hails from "just about everywhere," have come together via bucks, brains and, to put it bluntly, boredom, to revive socializing in New York. You can hardly blame them for yearning for something more. We live on a bustling island during an exciting time, but what for unplugging for longer than five minutes? Drinking somewhere besides a bar? Mazzei and Stokowski believe they have a solution for social stagnation, especially among design-minded New Yorkers. At Fair Folks & A Goat, everything you lay eyes on is for sale. It's both shopping and socializing, but most significantly it's a breath of fresh air. And, beyond the booty, this high-ceilinged, southern-facing sanctuary frequently transforms from informal sitting room into sketch studio, art gallery, concert hall and pop-up restaurant. Events run the gamut (think mother's day luncheons, wine tastings, trunk shows) and, if you're really lucky, you may even get a peek at the rooftop, which, when you lean over the edge, provides a great glimpse of Central Park. fledged operational hang space. Read on to hear what she had to say about their "lifestyle magazine in a space," their New Orleans location (escape from New York, anyone? ), and the origins of its unusual name. 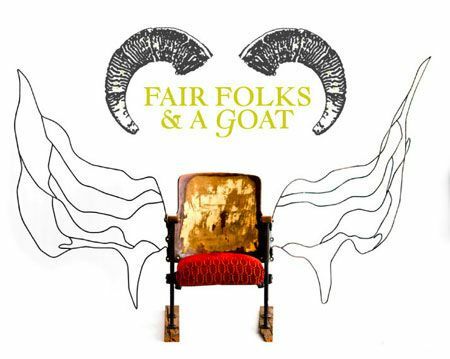 Can you explain the concept behind Fair Folks & A Goat? [It's] a space with every element of culture physically there, something [for] people to talk about. It's not getting trashed on the weekend, trying to talk over loud music at a bar; it's creating a space where people can come together and talk about something of mutual interest. Anthony was thinking about it as a lifestyle magazine in a space. You have design, music, art and fashion -- a little bit of everything. It's something for people to gather around. [We were] getting sick of the stuff going on [with] computers; people are sitting behind their screens instead of getting together and talking about these things! We wanted to build backwards a little bit, instead of forward. Wanted to be slow for a little while. Why did you call your project Fair Folks & A Goat? The name comes from a few stories, a conglomeration of them -- too many and too boring to recount -- but we loved the sound of the name, the way it takes the mind to places of fairytales and imagination. You opened in New York in November and in May you opened your second space, which also functions as a bed and breakfast, in New Orleans. Tell me more about that. It's a house. The New York space is beautiful, but we are limited. We can't [flesh out] the concept where everything in the space is for sale. We can't take that from room to room to room and show the full potential. In New Orleans, we have a number of bedrooms and front sitting rooms and a garden. So we can [sell] the bed linens, the clothes in the closet, the dishes in the cupboards, the sculpture on the mantel. Every element is something that was designed by somebody. We're working with a lot of young designers. In New Orleans we're working with a lot of New Orleans artists. There's a brooding aesthetic to New Orleans. We love that, but it looks completely different in our space. We have these bright white walls, all the curtains drawn back. It's so sunny. It's an uplifting environment. How much does it cost to stay at the B&B? It depends on the season and the length of stay. It starts at $95 a night. And it's in a very cool neighborhood too, right next to the French Quarter, off of Frenchman Street. Much more local and down to earth than Bourbon Street, for instance. All the jazz clubs are there. There's just such a vibrancy to that area. A lot of young people, a lot of cool things happening. What's your method for acquiring the items with which you furnish the spaces? Some people contact us, which is really great. Some people we reach out to because they're friends or friends of friends. Especially in New Orleans, everybody knows everybody. Once you're a part of [this network], you feel a sense of community. People are there to help each other. What can visitors to either space expect in terms of price points? It really depends a lot. We have these very cool, cardboard, dye-cut centerpieces that are $30, little bowls and cups that are from $45-$60. We have furniture that ranges. Pieces from $700 to $10,000. Some items, like the white loveseat, are kept in stock. But you also have one-of-a-kind pieces [winged chair]. What else? of-a-kind pieces as well. It just means we have room to bring in something new. So far we've been working with Archive Vintage. It's based in Dallas and it's mostly designer. They have beautiful pieces and all in really excellent condition. Our favorite thing to do is collaborate and find new connections. We're always willing to hear what anyone has to say. Are you the sole curator? I do the curating for pretty much everything except the art on the walls. We have one other person who's helping with that, Amy Sande-Friedman. She's based in New York. She does that and I do everything else, the design and the fashion and all that. We have a few things that we made for Fair Folks exclusively, leggings and t-shirts and we're thinking of expanding on that whole line. And everything here is insured? Yes. There are pieces that seem sort of precious. A lot of times people come in and ask, "Am I allowed to sit on this?" Yes, of course. A big part of the point is to get people to interact with the pieces in a different way. Not some sort of showroom where you're allowed to look but not touch. We want people to sit down. We've had three-hour-long conversations with strangers. They'll be like, "Are we friends yet?" [Laughs.] It's this weird thing. We want people to make themselves at home. Can you tell me a little bit about Fair Folks events? We used to have one event a month. We've recently started doing four events a month, which is great. It's a lot of work but it's a lot of fun to see the space come alive. We'll do anything that relates to things in the space. And since we try to cover every cultural element there is, we'll do things that relate to food, fashion, wine, music, design, art. We held an art opening where we had a performance artist do a piece. She performed in the middle of the room and everybody circled around her. We had a sketch artist who used to work in a courtroom doing scene sketches. She would do five-minute portraits for people. We had these two creative guys who were in the space, shooting footage for a documentary. They were engaging everybody, getting candid shots and interviewing people. It felt like a three-ring circus or something. All in one night! So, what's to come? Our ultimate goal, to the stars, is to expand. The New York space that we're in now is a model for what we wanted to build out into a full house, but we really want to bring that back to New York. We're playing around with the idea of other cities. Anthony's into anything southern. Austin, West Coast. So many options.